Well, believe it or not, it took me a few minutes to find what to post about for the letter T...which is really kind of amazing, and incredibly silly. 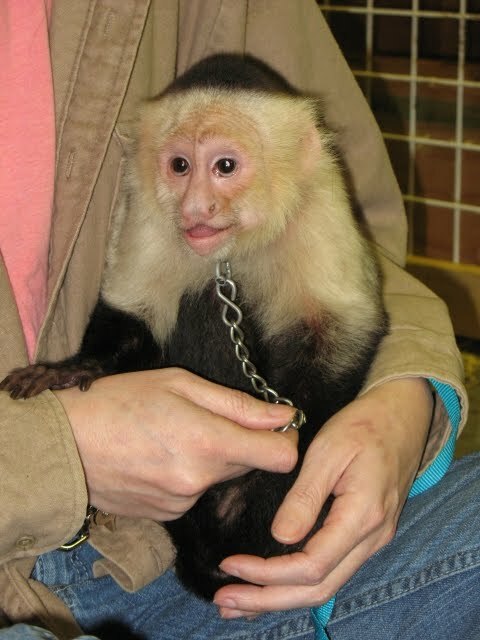 This is Toby, my Capuchin monkey. He's my sixth child and is a perpetual two year old. Thankfully, Jim and I always loved the two year old stage with our kids. Here's Toby, clipped to "the board." It's a place we clip him for training, for safe, hands-free holding while we change his bed crate and blankie...all that fun stuff. Last time he was here he decided he liked climbing the wall. A lot. He can scale that wall in .7 seconds flat. My oldest daughter is one of Toby's favorites. We were deep cleaning his cage and while I spelled her, she sat with Toby and watched us. While watching us, they got in lots of snuggle and cuddle time. Always a favorite thing. Toby is full grown and when he's sitting, he's the size of a bag of flour. Tiny but mighty. 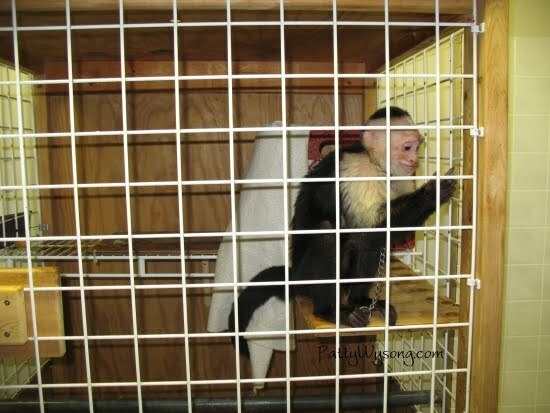 Below is Toby in his cage, his sleeping crate and blankie are behind him. Here we are...me and my baby. Growing up, some of my friends had monkeys as pets (hey, we were MKs in South America, lots of jungle all around.) 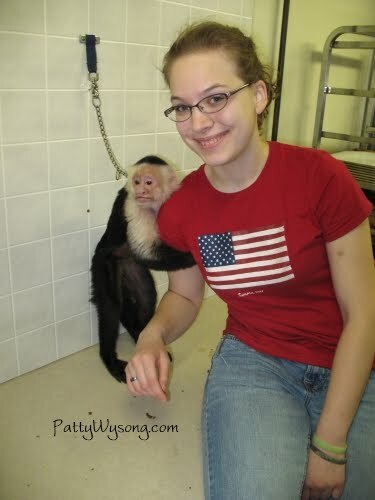 and I loved it the few times I had contact with monkeys...I just never ever thought I'd have a monkey. So tell me, is there an animal you always wanted for a pet? If you're joining us for the a2z: Take 2 meme by posting on your blog this week about the letter T, be sure to add your name and the link to that particular post in the linky gadget here. I've had some things come up in life...as they often do. 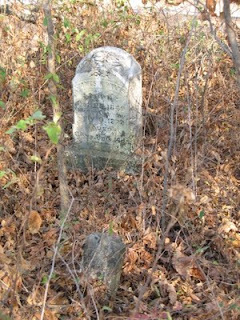 One of the things I like to do in the spring is to wander through the old cemetery that lies in the corner of our property. Why spring? Because it's my favorite season and I love looking for the little spring plants that flourish in the old stand of trees. The cemetery is no longer cared for, in fact, when we bought the property we cleared out the underbrush, making it accessible. It's very peaceful up there and in the summer, if there's any breeze to be found, you'll find it there. Last year I was late visiting and I missed all the violets blooming. If I time it right, there's a carpet of purple blossoms, but that time there was only lush green leaves. 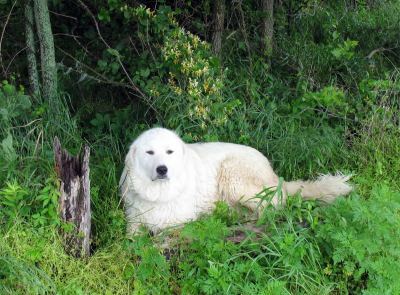 Because we live so far out in the country, ticks are everyday pests—especially with my two younger boys, and I'm constantly telling them to stay out of the woods and the tall weeds. I now remember why. About an hour after returning to the house I was washing my hands and I noticed a dark speck in my hair. I pulled it out and found it was a tick. I'm not squeamish about bugs (it's a good thing, too) but I instantly felt creepy-crawlies all over my body and had my daughter check the rest of my hair. I hadn't even stopped to consider ticks before going into the cemetery. But like I've told my kids, 'you can't go into tick country and expect to not get ticks on you.' I know there are things you can do to protect yourself, but I didn't take those precautionary steps, I just waltzed in. There are many times in our lives when we have to enter tick infested areas—many of us are in those areas on a daily basis, and not being there isn't always an option. These are places where sin runs rampant and is even lauded as being 'normal' or 'hip'. You can't just waltz in and think you won't be affected by it, you will, whether you realize it or not--just like I carried home that tick hiding in my hair. If I hadn't spotted it, it would have crawled right up that curl and onto my scalp and fastened itself there, living off me freely—at least until I found it and pulled it out. Have you ever had a tick fasten itself onto you? It doesn't feel nice when you pull it free, in fact, it hurts. When sin goes undetected in your life it's free to attach itself to you, to become a part of you, and when you go to remove it, it hurts. Just like some ticks can hold on tighter than you thought possible, so some sin holds onto you--it burrows under your skin and doesn't want to let go. It's really much better to prepare yourself before going into places where ticks run freely. 'An ounce of prevention is worth a pound cure' really fits here. There are many things you can do to keep the ticks from getting to your skin, even if it means looking silly or odd. But you don't even have to look different—you just need to spray with bug spray. Connecting with God and maintaining closeness with Him is the best way to repel the creepy crawlies that are all around. Saturating yourself with Him also makes you super sensitive to pests that would like to attach themselves to you. He heightens your sensitivities, allowing you to do away with the invader before it fastens itself to you. Ticks are just part of living in the country just as sin is part of living in this world. We just need to make sure to prepare ourselves so we can catch those creepy crawlies before they sink their teeth into us. The only man pragmatic Lilly Hart needs in her life is a six-year-old. Widowed for three years, Lilly has decided to leave the home of her intrusive in-laws to stand on her own. However, her in-laws find her new life as a cook at Lake Manawa utterly unsuitable for their grandson. When an argument ensues, a handsome stranger--who designs roller coasters, of all things--intercedes on her behalf. But Lilly is not about to get involved with any man, especially this cocky gentleman. Little does she know she is about to begin the ride of her life. 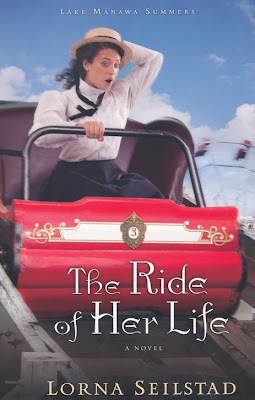 Since opening The Book Loft, I almost never do author spotlights here on my personal blog anymore, but when Lorna Seilstad has a book coming out, I clear my calendar and settle in for a wonderful read. She makes me laugh out loud (literally) and savor her book. Her characters are full, well-rounded, and not perfect--making them real and oh-so believable and enjoyable. Lorna Selistad is an author I follow closely and recommend highly. I have LOVED her Lake Manawa series and truly hate to see it end. If you're looking for a great read that's relaxing and gun, pick up this series! You can purchase The Ride of Her Life from Amazon and CBD and for Kindle. A history buff, antique collector, and freelance graphic designer, Lorna Seilstad is the author of the Lake Manawa series and draws her setting from her home state of Iowa. 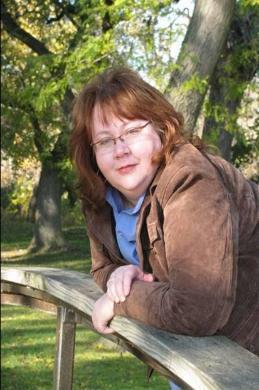 A former high school English and journalism teacher, she has won several online writing awards and is a member of American Christian Fiction Writers. Do you have a post about a great book you've recently read and recommend? Link up that post with us! It's hard to believe that it's been 2 years (almost exactly) since our Tuesday night Bible study started. Unbelievable. This group of ladies has been a huge encouragement to me. When study started, I was as green as you can get when it comes to teaching--green due to inexperience and green due to nervousness and fighting nausea every week over speaking in front of people. But those ladies stuck with me, let me scarf Skittles to keep my sugar going and laughed with me over some of the tangles my tongue got in. And they're still doing it. Amazing, beautiful ladies. But tonight is the last night I'll be teaching, for awhile at least. See, I need a rest. Not that I want one, but I need it. My bff noticed and so did my husband--and he asked me to take the summer off. So, I am. At first I was bummed because I've discovered that I LOVE teaching...because I love the study that I put into teaching. I'm convinced that I learn at least ten times the amount that I manage to pass on to others. I have been tremendously blessed by what I've learned over these two years. But now I'm excited about my summer off. I plan on doing a lot of reading. I'm looking forward to soaking myself in God's Word, like a summer long bubble bath in it. 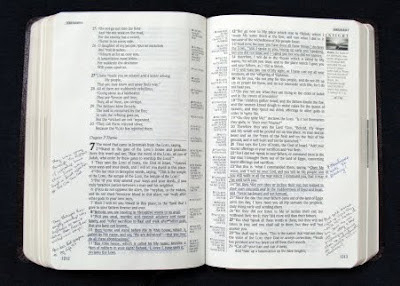 My cover-to-cover read through of the Bible, which I like to do in a year's time, has stretched out to two years this time. That's not a problem, but I miss the continuity of that reading. I'm really looking forward to a time of refreshment as I rest. The third part of my plan for the summer is wRiting. I have a goal set and am working toward it on a daily basis, which is very encouraging. Granted, mixed in with my 3 Rs is a full summer of family stuff, but I'll be carving out time for my 3 Rs. So tell me, what are your plans for the summer? If you're joining us for the a2z: Take 2 meme by posting on your blog this week about the letter R, be sure to add your name and the link to that particular post in the linky gadget here. Click here for more posts in the Persona series. Just like you don't want to build a house without plans or a blueprint, you don't want to just create a persona without thoroughly thinking it through. You want a persona that is you and that you're comfortable in. So, how to create a persona that is authentically you? Look for character attributes that you like in other people--people you know personally, acquaintances, or even public personalities. Watch to see how they present those attributes, what they do that lets you see those attributes. Want an example? Joanne Sher is an encourager. You cannot rub shoulders with her without being encouraged. That's a character trait I like and one I want to include in the persona I step into. So, for years I've been watching Joanne and then I apply that to my life. Another example is a lady in my church who has a genuine interest in others. When she asks you a question, she listens for the answer and there is no doubt she cares about what you're saying. So I've been watching her. She's a woman who loves to chat, but has mastered the art of listening and I'm trying to apply what I observe in her to my own life. So, look around yourself for people with character traits you like. Notice how they exhibit these traits. What do they look like when they're doing the things we admire? What mannerisms do they use? What are their facial expressions? What about their body language? You want to use role models to help you understand how they do what they do so you can apply it to your life. By watching others closely and taking note of how they express and demonstrate certain character traits, you are able to 'try it on' yourself and tweak it so it's you. Everyone has different sides of themselves. I do not act the same in a formal setting as I do when I'm home with my family, but I'm still the me in both situations. By combining these sides of me with what I've observed and learned from careful study of others, I found my persona--one I am totally comfortable in, that is 100% me. My persona has totally changed my life. I'm still Patty and reserved and I'm still goofy Peejers and Bratty Jo (just ask my sister), but now I'm able to combine them, bring out their strengths and utilize things about me that I didn't have access to before. So tell me, do you have a blueprint for you? 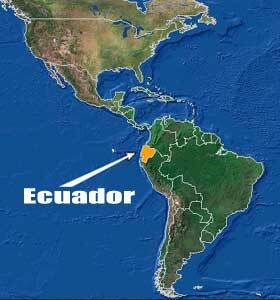 Of all the Q letters in our language, one of my favorite is Quito (pronounced Key toe). 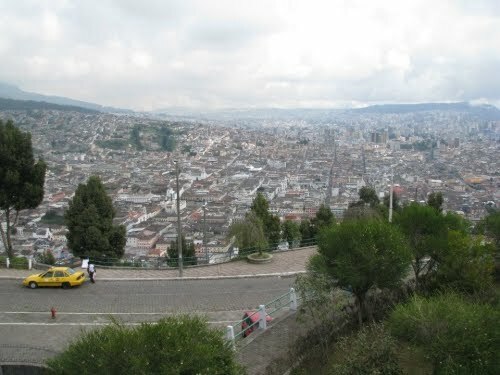 Quito is the capital city of Ecuador, in South America, and where I spent my teen years while my parents were missionaries. It's a place I hold close to my heart and hope to revisit someday. 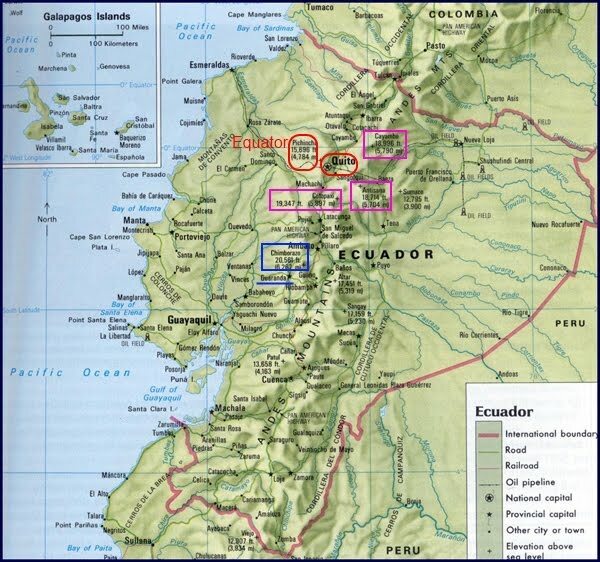 Below I circled Quito in red. You can see it's in the heart of the Andes mountain range. The pink boxes are mountains I saw most days, except in rainy season when they spent a lot of time encased in clouds. If you look closely, you can see the elevation of the mountains listed. They're snow capped and awesome. A sight you NEVER grow tired of. Most of my days were spent in at the Alliance Academy, a missionary kids' boarding school run by the Alliance mission. To the left is a picture of part of the school, the other part is to the left of the picture. That's not a football field, it's a soccer field since that's the sport of choice there. 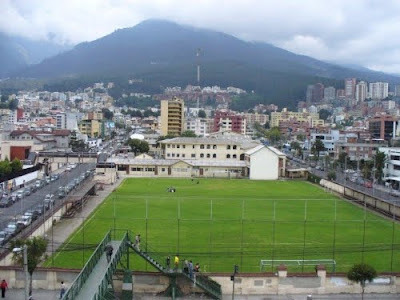 The mountain in the background is Pichincha, which runs parallel to the city. People would hang glide from Pichincha into the city. 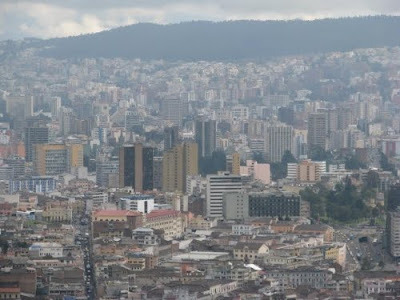 It must have been a breath-taking view because just looking at the city from Pichincha was fantastic. Going up there was a favorite outing. 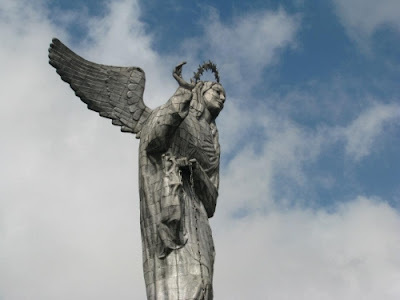 Another place to visit is the Panecillo--the Virgin. She watches over the city and offers a great view. The legends that go with the "hill" she sits on will curl your hair. But then, much of the Incan culture might do that, as well as wow you with their feats. It still amazes me to think of all they did with the technology available to them. Part of the view from the Panecillo. The old town where culture and history are rich and in full color. And the new city where technology is alive and well. 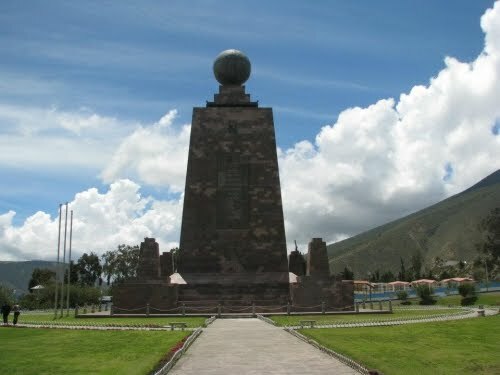 Quito is just South of the Equator so visiting Mitad del Mundo, the monument on (well, technically it's just close to) the Equator, is a must. Standing with foot in the Northern Hemisphere and one foot in the Southern Hemisphere is one of those Kodak moments you don't want to miss. And there's a quick glimpse of the city of my heart...Mi Querido Quito. So tell me, where do you consider home? *Photos courtesy of Trina Mayfield, a missionary friend who still lives in Ecaudor. Thanks, Trina. If you're joining us for the a2z: Take 2 meme by posting on your blog this week about the letter Q, be sure to add your name and the link to that particular post in the linky gadget here.